I tried to import some of my GitHub repos to Bitbucket but I ended up at an endless spinning circle... When I tried to disconnect my GitHub account, I got an error saying that I have to set a password fist. I do have a password set and even changing it didn't work. 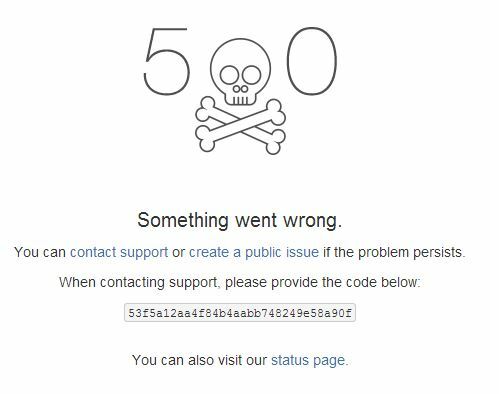 I then revoked access to Bitbucket in my GitHub account and got the error "We're having trouble connecting to Github :(" at the 'Connected Accounts' section. When I press the 'Reconnect' button, I can authorize Bitbucket as an Application at GitHub but when I press 'Authorize application' I get redirected to a 505 Bitbucket page. Could it be because I changed my account name on GitHub recently? I can confirm I'm seeing the same behavior after disconnecting and trying to reconnect my Github account. @Dan Ross does that happen consistently every time you reconnect? I'm asking as I can't seem to reproduce this. It is consistently for me and it is still there :( I tried it from different computers with allways the same result. If you're still experiencing problems with this issue, please check out https://bitbucket.org/support. If you can't find a solution through our support site, please raise an issue with our technical support team directly.